WASHINGTON (Dec. 07, 2012) -- In advance of the Army's 113th face-off against Navy on the football field, U.S. Military Academy cadets of the Spirit Band marched through the halls of the Pentagon Friday to rally support. This year the cadets from West Point hope to finally bring home the coveted "Commander in Chief's Trophy." 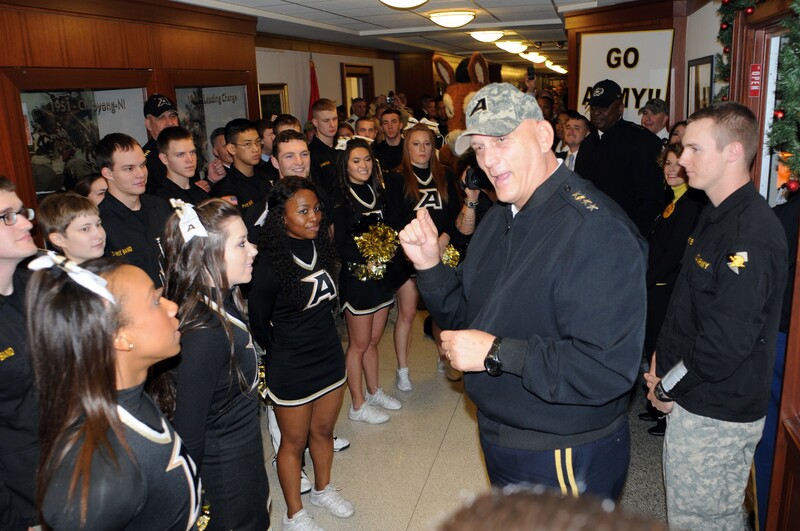 Chief of Staff of the Army Gen. Ray Odierno met with cadets from the U.S. Military Academy at West Point, N.Y. The cadets were part of the school's Sprit Band and cheerleading team, and visited the Pentagon to rally support for the Dec. 8 Army-Navy game in Philadelphia. The Black Knights from West Point will square off against the Naval Academy midshipmen, Dec. 8, at Philadelphia's Lincoln Financial Field. 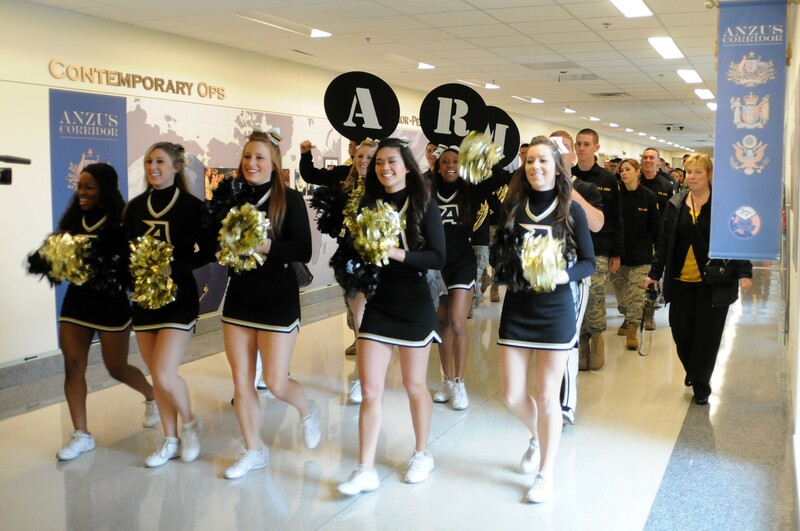 Marching through the corridors of the Pentagon, members of the school's Spirit Band played music loud enough to be heard floors away, and at a few locations where they stopped to play to a gathering crowd, the school's cheerleading team led passersby in cheers to rile up support for the Army. The cadets didn't march aimlessly though the building, however. They stopped off at a few key spots; in some places to find support for the Army from the top-tiers of Pentagon leadership, and in one location, to make a show of force in front of the enemy's senior-most leader. The cadet corps stopped first to visit Secretary of Defense Leon E. Panetta, who appeared delighted to see the young college students waiting outside his office. "I want you to know first and foremost how proud I am of all of you that are part of our military," Panetta said. "You guys are great. I have the best military in the world because of the men and women in uniform that serve this country." He said no matter the service, he's proud of the service members that work for him. Having been to Afghanistan and Iraq to see the conflict there, he said that cooperation between services in important. "But having said that, on Saturday you're going to meet on the football field, sports field, and there will be a great competition between two great academies," Panetta said. "It's a great tradition, and I think it's something everybody looks forward to. And you know you guys all know, I served in the Army ..."
Hoots and cheers from the cadets indicated they hoped for a flat-out Army endorsement from the secretary, whose job it is to lead all branches of the U.S. military. "But as secretary of Defense, I take a neutral position," he said. Groans from the cadets indicated they were disappointed the secretary had opted to play it safe. "But if the time has come guys!" he said; and the cadets cheered, even though his endorsement was but a wink. 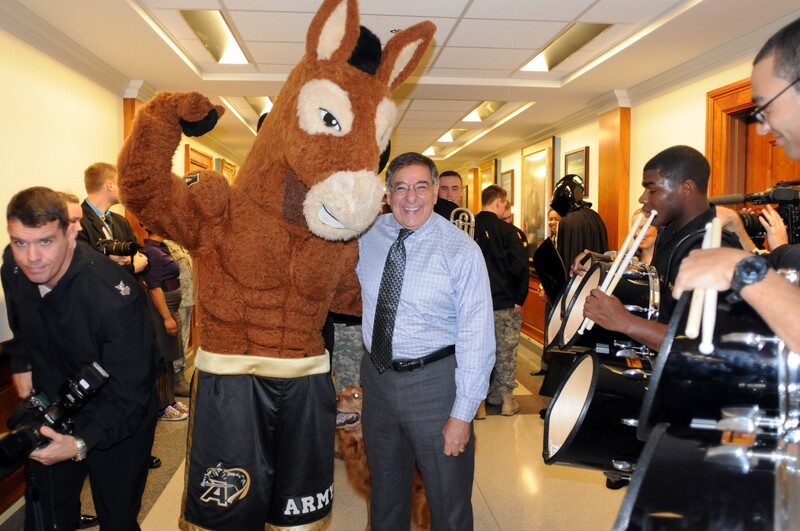 Secretary of Defense Leon E. Panetta met with one of the mascots of the Black Knights football team, Dec. 7, at the Pentagon. Panetta handed out challenge coins to every cadet in attendance, and also introduced them to his dog, Bravo, who'd been frolicking in the hallway outside the secretary's office. Cadets also marched off to visit with Secretary of the Navy Ray Mabus, who started off by explaining his pride in all branches of the service. But his pride in the joint force didn't keep him from laying into the cadets with a friendly jibe, in a hope to stifle their spirit. "No matter how bad the Navy season has been, no matter how tough things are, you guys always make us look good," he said. "The last time you all won, you all were in middle school. I got bad news for your younger brothers and sister; but I think there may be some hope for their children." Over in the Army corridor, cadets got more love from their own service's leadership, Chief of Staff of the Army Gen. Ray Odierno and Secretary of the Army John M. McHugh. "I want to talk to you all, those who provide the spirit, [about] the important job you have tomorrow to make sure that the corps is ready," Odierno said. "We need everybody behind us to make sure that we do everything we can to win that game. And I know you are up for the task, right? We are ready to take on this victory, when Army beats the hell out of Navy. To the oldest service, to the best service; tomorrow we will beat Navy." McHugh told cadets he was confident that by the end of Saturday, there would be a lot of sad Midshipmen, because the Army had finally brought home the Commander in Chief's Trophy -- they haven't had it for 16 years." "This is a great day, but it's going to get even better for the Army tomorrow. I can feel the tide turning. I just want you to know the Navy folks came through here yesterday; they looked great, they looked terrific. But it's going to be so sad to see them tomorrow with tears in their eyes," McHugh said. "We're going to be there in spirit, we're going to be there in strength and God love you, the Commander in Chief's cup is coming home to where it should be." Before the cadets left, McHugh reminded them that while the football game is competitive fun, players from both teams, and the cadets themselves, are actually on all the same team. "Tomorrow, when the game is over, the players from both teams will walk off that field, and join a better and bigger team, that of the defense of the greatest country the world has ever seen," he said. In the Pentagon courtyard, the cadets gathered for a pep rally attended by Pentagon employees, and a lot of Soldiers, to rile up support for the weekend's big game. In advance of the Army's 113th face-off against the Navy on the football field, members of the U.S. Military Academy's cadet corps, part of the school's Spirit Band, marched through the halls of the Pentagon, Dec. 7, to rally support for the game. Mario David Turi, an engineering management major at West Point who is in his senior year, had served as a "rabble rouser" for the team. He was impressed, he said, with his visit to the headquarters of the nation's military. "It's a big maze," he said. And while Odierno has visited West Point in the past to address cadets there, Turi said he was glad to get a more personal visit with him. "Meeting him in person is impressive," Turi said. The fourth-year cadet has already chosen his branch in the Army, aviation. "I don't know my air frame yet," he said. "But I'm hoping to fly Apaches." He's not sure yet what he'll fly in the Army, but Turi feels confident of the outcome of Saturday's game. "I've watched every game," he said. "The Army fights hard, and I think we've won the games we need to bring home the Commander in Chiefs trophy tomorrow." Carlton Blake, an engineering management student in his second year at West Point, plays the drums in the Spirit Band. He said he wants to branch into combat engineering and "stay in the engineer corps and hopefully become the commander of engineer corps one day, hopefully." He said he's sure the Army will win Saturday against Navy, because he's talked to buddies of his on the team who've assured him of as much. "Army's going to win tomorrow," he said. "I've got no doubt about that. I've got a couple of friends on the Army team; from what they say, we beat Air Force and now hopefully we beat Navy." Also a drum player, Edward McBride, geospatial information science major in his senior year at the academy, said the pep rally at the Pentagon demonstrated to him that it's not just cadets who are rooting for the Black Knights at Saturday's game. "The pep rally shows how much spirit the actual leaders of the Army have, and not just us as the Corps of Cadets," he said. "And the Army is always going to win."